If the creamy white one is a girl, we will keep it with her mother, Foola. The Kitten has already named it Beautiful Sparkly. 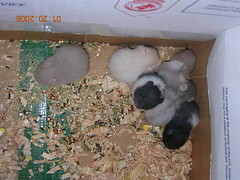 The gray one with the stripe down its back is adorable, the two tan ones have red eyes, and one of the oreos likes to make squealing noises. We love 'em, but we can't keep 'em.